Prometheus is an open-source systems monitoring and alerting toolkit originally built at SoundCloud. It is now a standalone open source project and is maintained independently of any company. To emphasize this, and to clarify the project’s governance structure, Prometheus joined the Cloud Native Computing Foundation in 2016 as the second hosted project, after Kubernetes. 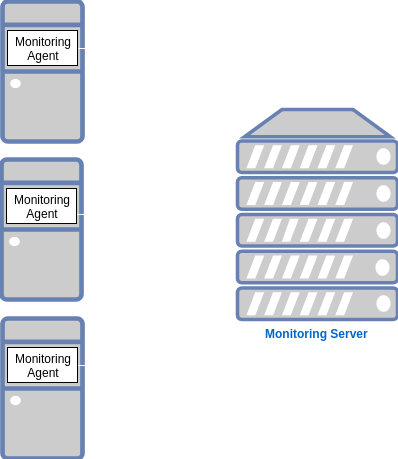 Unlike the traditional push methods where a monitoring agent would collect the metrics and will push to a centralized Monitoring server. Prometheus uses exporters that collect the system metrics and expose them at a defined endpoint from where the Prometheus server scrape or pulls the metrics. 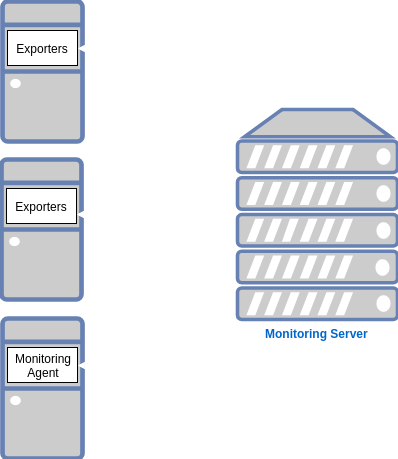 The exporters are responsible for collecting and exposing Prometheus metrics for third-party or uninstrumented services. It resembles the monitoring agents in the traditional Push model. Prometheus itself is only responsible for monitoring, and features such as alerting, visualization, data storage is managed by separate and independent components providing a totally modular design. Prometheus evaluates the alerting rules as per the metrics data collected and send alerts to Alertmanager in case of a violation. Alertmanager then accordingly group, and categorize them as per the defined rules, and send the alert notification to the different notification channels configured such as slack, hipchat, email, pager duty, etc. A time series is a series of data points indexed (or listed or graphed) in time order. Most commonly, a time series is a sequence taken at successive equally spaced points in time. We assume that you already have a running Kubernetes cluster. If not, go ahead and create one a small one now that you can use to follow along. We will be using the Helm charts for Prometheus located at https://github.com/kubernetes/charts for this example. This will apply the values.yamlfile to the stable Prometheus chart maintained by the Kubernetes project and will deploy it using Helm. Using above annotation Prometheus will autodiscover all of your services and will start monitoring them by scrapping the metrics. Now edit stable/grafana/values.yaml and change the values of adminPassword, size, and storageClass to your liking. Now, search for url and enter the Prometheus service endpoint. Login to the Grafana UI by pointing your browser at localhost:_<local-port-number>_ and enter your admin name and password. Leave rest of the fields to the default value and click on Add. Your Prometheus setup should now be successfully added to Grafana. You can now browse and add various dashboards to see the metrics gathered from Prometheus. Some of the common pre-configured dashboards can be found at: https://grafana.com/dashboards. Apart from being deployed as a dedicated Kubernetes resource, Prometheus can also be deployed as a Kubernetes Operator. 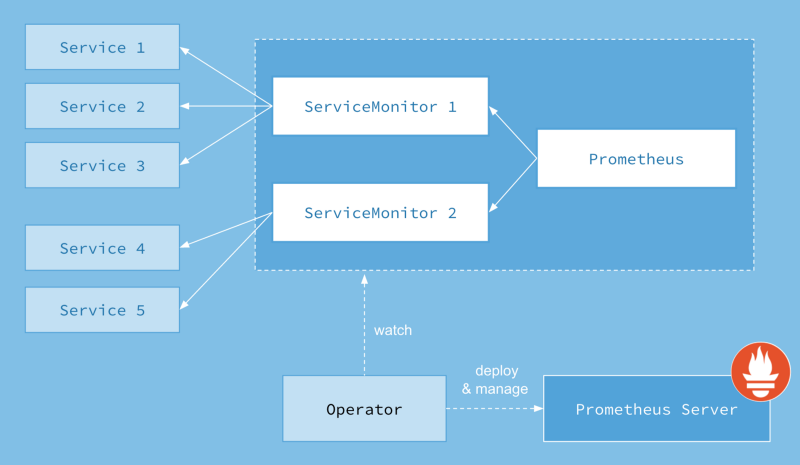 Using the Prometheus Operator we can natively and easily monitor the Kubernetes resources apart from managing Prometheus, Alertmanager and Grafana configuration. Prometheus Operator uses a Custom Resource Definition (CRD), called ServiceMonitor, to manage the configuration. The ServiceMonitor will use the matchLabels selector to choose the resources to monitor and the Prometheus Operator will be using the label selectors to search for the resources after which it will create a Prometheus target so that Prometheus can scrape the resources for the metrics. Now you can view Grafana and Prometheus using their services prometheus-suite-grafana and prometheus-suite respectively.